After serving four years as the superintendent of the Ravenswood City School District, Dr. Gloria Hernandez-Goff is now facing what appears to be a crisis looming over her administration. Her office is now mired in controversy and the controversy is taking its own twists and turns. The seriousness of the situation in the school district became evident when the Ravenswood Teachers Association (RTA), submitted a letter and a petition to the Ravenswood City School District Board during the board’s regular meeting on Thursday, April 27. The petition called for the superintendent’s immediate resignation and it carried the names of one hundred forty-three teachers who taught in the school district. The RTA said that the teachers had given the superintendent a no confidence vote, and it cited specific grievances against Hernandez-Goff’s leadership and her work within the district. With the presentation of the letter, listing the RTA’s concerns with the district, the controversy that the no confidence vote has generated has left many in the East Palo Alto community reeling and asking other questions that go beyond the issues in the teachers’ letter. Not only are there now questions being raised about the superintendent’s skills as an administrator, but questions are also being raised about nepotism in hiring within the district and some of the personal relationships of at least one member on the school board. The first development, which surprised many in the community, was the letter, itself, calling for Hernandez-Goff’s resignation. In the letter, the RTA said that the grievances against the superintendent were related to six professional standards of excellence that they said she failed to meet. “Three years ago, the Board of Trustees and I began a series of stakeholder conversations leading to Thursday night’s vote approving the timeline of the Ravenswood Comprehensive Middle School. 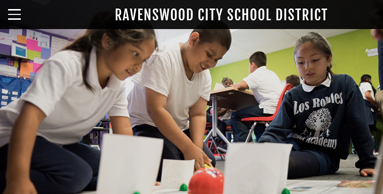 Through these open and transparent conversations, it became evident that it was critical for the District to move away from the status quo in order to give Ravenswood’s children the best possible opportunity to advance in their academic journey. The Board of Trustees and I recognize that change is never easy, but we are not in a position where we can afford to play politics at the expense of our children’s education and future. For that reason, the Ravenswood Comprehensive Middle School will begin with its first cohort of students in the 2017-18 academic school year. Both the superintendent and the RTA seem to agree that the Comprehensive Middle School is the catalyst that brought the current controversy involving the school district to a head. The district sees the Ravenswood Comprehensive Middle School as a way of providing “a sixth through eighth grade program that supports student growth through academics, enrichment opportunities, and strong family partnerships,” and supports its opening in the fall of 2017. The planning for the CMS started more than a year ago, and it had a projected opening date of the fall of 2017. The district office argues that it set up a CMS Task Force and sought the input of teachers, parents and other community members throughout the review and planning process. The teachers association accuses the district of setting up committees, but not empowering them to make decisions, speak to each other or give input into the overall plan. The RTA also accuses the district of calling staff meetings at the last minute, of informing parents and families of teacher reassignments before informing the teachers themselves, and of a host of other actions that failed "to foster an environment that is conducive to rigorous teaching and learning." Sharifa Wilson, who has served several terms on the school district’s board of trustees, defends and supports the district superintendent. She claims that the criticisms the RTA is leveling against Hernandez-Goff are personal and that the union is throwing everything in the mix to get a better contract for the teachers. Wilson pointed to things she saw as other improvements: “We now have an alignment with the Sequoia High School District, which means we have our teachers doing professional development together. The teachers are now aware of what the students need. Now 10% more students are enrolled in A-G prep classes at Menlo Atherton High School. More students are now focused on preparing kids for college and beyond to give them a sense of hope and personal accomplishment. “We know that the teachers want a raise, so they say, 'Let’s create this hell.' Are they trying to undermine the success? We finally have successes, more increase in parent engagement and you want to get rid of the superintendent?” Wilson asked. Some are now raising questions about Wilson’s support of Hernandez-Goff and her relationship with the head of the CMS task force. There are also charges that Hernandez-Goff, currently, has her son on the school district’s payroll and, in the past, also had her daughter on the payroll. The district office has yet to respond to the nepotism charges. The next school board meeting will be held on Thursday, May 11 at 7:30 p.m. at the district office at 2120 Euclid Avenue in East Palo Alto. As the charges and the counter charges fly back and forth, many will be awaiting answers and a resolution of the conflict. After all, as all sides might agree, it is the education of the children that is at stake.